Be sure to follow the link at the bottom of this page so you can download and print free planning sheets. MAIL your invitations! If you are not catering your event, or only catering part of the event, start planning the menu. Appetizers, salads, finger foods, and desserts are the way to go if you are serving more than 10 guests. A buffet style is a good idea if, you want to serve a meal. Not sure what to do? Consider the time of day: A party with a start time between 11:30 and 12:30– you’re on the hook for a lunch. This does not mean you need to serve 25 guests a full course sit down lunch. However, you need to have more than snacks and cake. Sandwiches, fruit, and salads, along with dessert and refreshments are usually just fine. The same rule applies to the breakfast hour: between 8:00 and 10:00 (start time). Breakfast is usually served as a brunch. Dinner hour between: 5:00 and 6:00 (start time). Brunch or dinner can be served buffet style. With both meals, try to offer, one or two hot food choices. This will require hot plates or warmers to keep food warm/hot. If your baby shower starts anytime between 1:00 and 4:30 in the afternoon, finger foods should be fine. Keep in mind, you’re guest of honor is pregnant. Even though you’re not serving a full course, don’t skimp on the food. Order the cake or cupcakes from the bakery. Assign or hire a photographer for the party. Choose games and activities if you plan to have any (1 to 2 games or activities). Purchase or finish any decorations, party favors, or party gifts you will need. Purchase plates, napkins, cups, etc. If you are using your own serving pieces, locate items and prepare them. Iron linens and polish silver. 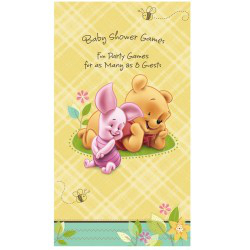 Are you planning games for your party, or need other baby shower supplies? make some phone calls to either borrow or rent the items. Arrange childcare or a sitter if, there will be young children at the shower. Make a list for the grocery store and keep adding to it as the party approaches. Continue to do any DE cluttering or polishing around the house. Call the catering company, hotel, restaurant, or any other vendor that may need a final head count. Shop for, purchase, or make your baby shower gift for mom-to-be. Double check any food aversions or preferences mom-to-be may have before you finalize your grocery list. The following is a list of foods pregnant women are recommended to AVOID. This is not medical advise. Any questions or concerns should be directed to a medical expert. make sure mom-to-be has her favorite menu items to choose from. It’s also a good idea to label food items (you never know who has food allergies). Fish: including, but not limited to, shark, swordfish, king mackerel, tile fish, bluefish, tuna steak, striped bass, freshwater fish and canned tuna. Do your grocery shopping and buy what you can. Fresh salads,fruits and veggies should be purchased one day before the baby shower. Make arrangements for your guest-of-honor to get her gifts home. Organize the flow of the party (a general schedule is fine)! Decorate gift table, guest table or any other areas designated for the baby shower. Decorate or reserve a seat where mom-to-be will open gifts. You can use a sash or corsage to do this. Place a pen and tablet in the seat next to mom. This is for the guest who will be recording gifts. TIP: Place a manila envelope out as well. This is very handy for preventing the loss of gift receipts and gift cards. A trash bag (for gift wrap and scraps), extra pens, and scissors can be placed out of the way. Double check your list and touch base with your co-host. Finish any cooking or prep food that can be refrigerated over-night. Make sure you have all the serving pieces and equipment needed. Baby Shower Planner: Party Day! TIP: As you greet guests, ask them to write their name and address on the envelopes that are included with your thank you cards (envelopes can be set out next to the sign-in book, advice cards, name tags, etc). Voila! Pre-addressed envelopes! This will save mom-to-be, lots of time! Ask a friend/guest to be the gift-recorder for gift opening. TIP: Record gifts right on the back of the greeting card that came with the gift (with approval from the guest of honor of course). Be a polite, attentive host and have fun! As the party is winding down, be sure you and the guest of honor thank everyone for coming. After the party is over, help mom-to-be pack her car (she’ll probably have lots of new gifts). Make sure she has the addresses of all the guests so she can send thank-you notes (should be mailed 5-10 days post party). *She’ll probably also want to send birth announcements to her guests after the baby is born. Baby Shower Planner: What’s next…? Clean up the important stuff and put away perishable food. Hopefully, you have lots of clean-up help from the other host(s). After that, you can keep cleaning… or open a bottle of wine, soak in warm bubble bath… and finish cleaning tomorrow! I know what I would do! !